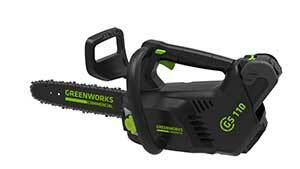 Greenworks Commercial expanded its product line with the GS 110 10-inch brushless top handle saw. Precision limbing and one-hand cutting tasks are made simple with the GS 110’s compact design and the convenience of lithium-ion battery power technology, according to Greenworks. The product is powered by Greenworks Commercial’s proprietary 40-v lithium-ion battery and brushless motor technology. It yields 50 percent less noise and 5 times less vibration than gas equivalent products, according to the company. Steel bucking spikes to help prevent kickback out of the wood. The GS 110 comes with a two-year warranty on both the battery and the tool. It’s now available now through the Carswell, Carswell OEI, Conniff, Edney, PACE, Steven Willand independent dealer networks and SiteOne.